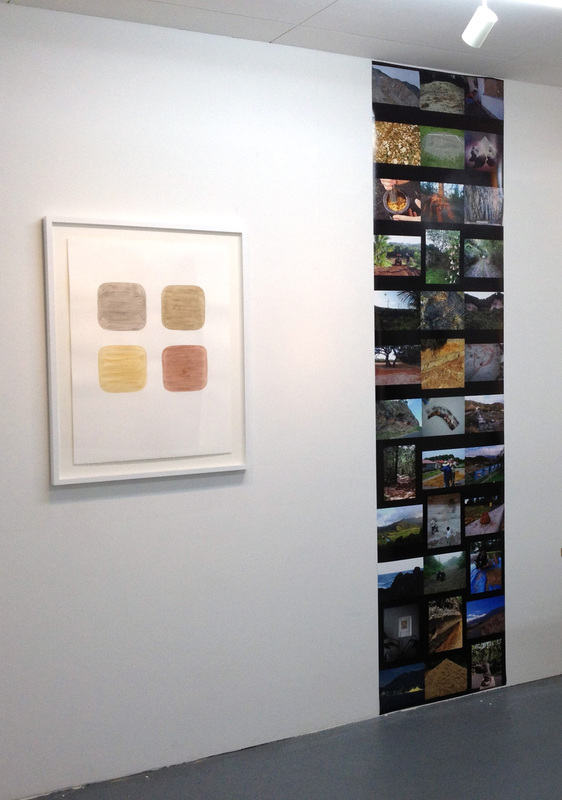 Two of my artworks are now on display in a group show at Satoshi Koyama Gallery in Nihonbashi, Tokyo. On the opening day there was an artists roundtable discussion in which we discussed our creative pathways and discovered junctures between us. At first the fluorescent light works of artist Mitsunori Kurashige felt very cold and a bit stale to me, but as our dialogue opened I realized his works are more about the viewer’s experience of space. He spoke of the view of the works from down on one’s knees and the intersections between the creases of the wall and his blue lights. Once we realized that we had a mutual friend, artist Shingo Honda, there was a natural affinity in our approaches even though our artworks couldn’t look more distinct on the surface. 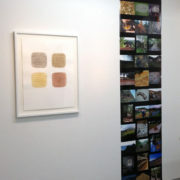 I spoke about my new photographic work that is part of the “Philosophies of Dirt” series created just this month. This work is based on my deep fascination with film strips, I remember developing film as a teenager, the excitement I felt when stretching out the wet negative film strips to dry. The light that passed behind these images now in physical form captured something raw, not only in those moments when the images were taken, but in the present moment gazing through these unedited film strips. Each image recalls a story in the connection between my own life and these places, part of which is held in a small sample of dirt that enters my studio but also part of which is contained in these photographs. The windows that I create in each drawing for the series “Philosophies of Dirt” are not so different from the windows of the camera, neither one is clear, but instead they contain the cloudy traces of experiences that are still occurring now. Please come by and enjoy this exciting new exhibition open until February 9, 2013. Also there are only a couple of catalogs from my solo exhibition still available at the gallery so inquire soon to get your copy. This 58 page full-color catalog includes an essay by poet Brandon Shimoda alongside select drawings from the series “Philosophies of Dirt.” Order here.